As player safety and concussions take the lead in talks around the juice-box cooler, helmets and their proper fit should follow right behind. New helmet technology is constantly evolving, but the battle against concussions doesn’t have to be waged with brand new gear every year. Keeping hardware, straps, and padding in good condition is a crucial first step, as is making sure a helmet fits the way it should. When it comes to the shock absorbing padding, soft foam inserts have been around for a long time. Noticeably, though, those pads don’t stay so squishy throughout the years. One of the easiest ways to keep a helmet in good condition, according to LSU equipment manager Greg Stringfellow, is to clean the foam padding occasionally, either at the end of a season or whenever the helmet will be left unused for an extended length of time. Antibacterial washes can extend the life of a helmet’s padding at least a season, he points out. The sweat that accumulates on the foam padding can cause corrosion and cracking, rendering the padding hard and ineffective. In many of today’s modern helmets, manufacturers are taking a page out of cycling’s book when it comes to new padding technology. Riddell, Easton, and other companies are now choosing to use harder[,] Expanded Polypropylene Plastic (EPP) foam, which is one step closer to the rigid foam used in bike helmets. This EPP foam has higher impact absorption, is lighter in weight, and is generally paired with softer foam to cushion the head. It also doesn’t break down with sweat, leaving only the smaller cushioned parts of the helmet to be replaced. In addition to keeping a helmet’s padding in good shape, checking the condition of a helmet’s working parts, like the chin straps and other snaps, is vital. Another potential option is to have a helmet reconditioned by a local dealer or by sending it to the manufacturer. While the costs of shipping and reconditioning may add up, its generally cheaper than buying a new helmet. However, a 2010New York Times exposé found that few, if any, helmets are re-tested after reconditioning, so the process doesn’t necessarily guarantee that a helmet is returned in a safe, usable condition. Likewise, a separate New York Times analysisfrom last year found that, due to performance concerns, any helmet more than 10 years old should be completely avoided. And keep in mind that even in perfect condition, a helmet is ineffective if it does not fit correctly. A rule of thumb for all helmets is to make sure the helmet fits firmly but comfortably. Stringfellow looks for the padding to pull the skin on a player’s forehead when he tugs the helmet slightly. It is also important to start with a properly sized helmet, and then make the necessary adjustments from there. 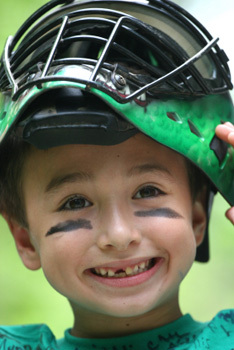 A proper mouth guard is the last key to helmet fitting and concussion prevention. Not only do mouth guards protect an athlete’s teeth and mouth, the force absorbed by the rubber can decrease the impact of a blow to the chin enough to minimize and even prevent concussions. Take it step-by-step, start with sizing. A helmet’s front pad should sit approximately one inch above the eyebrow. Then, the chinstrap should be adjusted to a snug fit. Once the helmet is in its correct position, the air cushions can be inflated to evenly distribute pressure to all points of contact. Stringfellow’s one note of caution for parents of young athletes—don’t get caught up in the newest helmet technology too soon. He said the newer helmets have gotten heavier with added padding and can be too heavy for kids with weaker necks. If a child is continually dipping their head due to the weight of a heavy helmet, it can lead to serious spinal injuries and more concussions. There are no air cushions so custom fitting can be more difficult. Adjust sizing screws or knobs until the helmet is snug. Don’t let the helmet get too tight. A white spot on the forehead seconds after the helmet is removed shows it has been set too small. Recheck the initial fitting. Make sure that the helmet will stay in place even after a player’s sweat has caused the helmet to be slippery. Purchase a facemask that corresponds to the helmet model. The chin cup should fit properly and the mask should not interfere or change the shell’s fit. Use the “two finger rule,” making sure only two fingers can fit between the chinstrap and the bottom of a player’s chin. University of Michigan hockey equipment manager, Ian Hume, likes to limit the slack to just one finger. Hume and University of Minnesota hockey equipment manager Lee Greseth warn against using a hockey helmet too long because of the hardening of the foam. “Nobody seems to be able to tell you when that foam begins to lose its effectiveness in protecting the player,” Hume notes. He only allows his players to wear a helmet for one year, and then it becomes their practice helmet. Greseth doesn’t let his players or his children use a helmet for more than two years. Keep a baseball helmet snug, not only for blows to the head, but also to help maintain concentration in the batter’s box. Without a chinstrap, it’s important that the helmet stay on while a player is running. Proper fitting ensures higher safety while running the bases and in the possibility of a collision. Never cut out or downsize padding to make a helmet fit longer to accommodate a growing head. “When you get a helmet that’s too big, the padding is not fitting in the places on your head where it’s meant to protect.” Stringfellow explains. “It affects performance and can be bothersome to kids and affect their vision.” One of the biggest issues he sees in youth camps [is] players cutting out or downsizing padding to make a helmet fit longer. Not only does that defect the warranty, but puts a player at serious risk of injury. It’s always important to make sure you’re buying an approved helmet, a NOCSAE (National Operating Committee on Standards for Athletic Equipment) approval is important in making sure the helmet will do its job. Double-check a helmet’s sizing with the manufacturer’s charts. Similar to football, the location where a lacrosse helmet fits in relation to a player’s eyes is important. A general rule is to have the forehead pad rest just a finger’s width above the eyebrow. This ensures both that the forehead is protected and that the player can maintain a good field of vision. Adjusting the helmet to a snug fit is different from brand to brand. So, it’s important to be familiar with each helmet brand’s adjustment mechanisms to ensure a good fit. Finally, tighten the chinstrap so that there is no slack and check for excess wiggle room. U.S. Lacrosse guidelines note that screws and t-nuts on a helmet should be replaced each year. And if the facemask is ever bent, or no longer fits cleanly on the helmet, it should be replaced immediately. Also, plan a child’s haircut accordingly; a summer trim can affect a helmet’s fit.